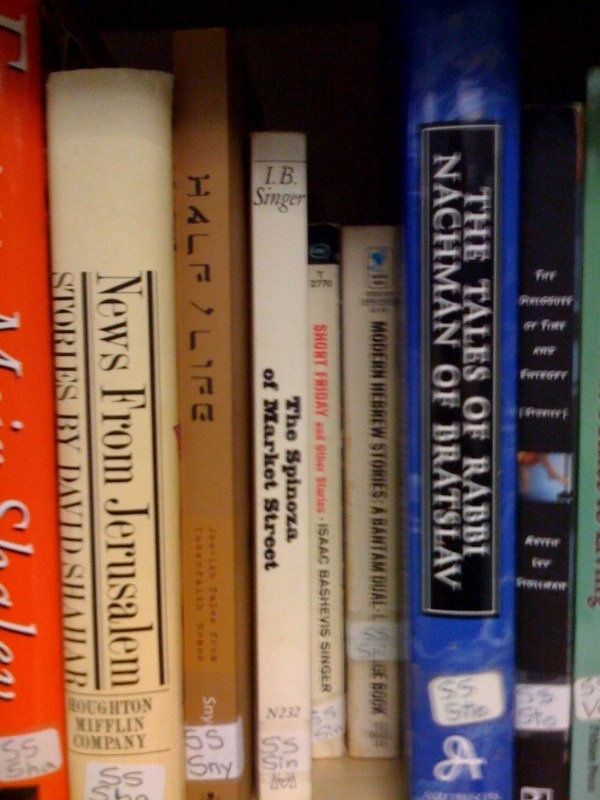 It occurs to me that this morning’s rant is not unrelated to my experiences a few years back, editing Half/Life: Jew-ish Tales from Interfaith Homes. When my then-agent shopped Half/Life to the Jewish press, they were critical, nervous, and asked me to go find some celbrity contributors.Â Intermarriage was a tricky subject, they said. So I ignored them, and took the project to that BEST OF ALL PRESSES, Soft Skull Press! Who did an amazing job.Â Yay, Soft Skull!Â Half/Life was a weird title for them.Â A Relig-ish book at a punk rock press.Â But they were incredible. I could not have asked for a more supportive, understanding publisher. 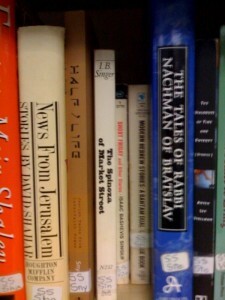 And today, just coincidentally, after angsting over Jewish kidlit and how to push those limits, a friend emailed me the picture above, a picture of Half/Life, shelved in the library at a JCC. Funny, how the problematic books get absorbed into the mainstream and that changes the conversation we have about the problems.Â Funny how the zany ideas do, eventually, wiggle their way into the land of not-so-zany.Â Funny, how the universe expands. This entry was posted on Wednesday, February 18th, 2009 at 2:28 pm	and is filed under Blog. You can follow any responses to this entry through the RSS 2.0 feed. You can leave a response, or trackback from your own site.